Client Ratings Vinh Pham has been rated by 29 clients. I’ve lived in many places and have learned to value the importance of community and heritage. I find so much joy helping my clients find the perfect place to call home. Whether you’re born in Canada or new to it all, like I once was, we are all looking for the same thing: home. I was born in Vietnam and raised in a few different parts of Canada including St. John’s, NL and Toronto, ON, before finally calling Edmonton, my home. As a very young refugee, leaving Vietnam, my Dad took me on an amazing adventure; throughout our journey, we faced starvation, a capsized boat and chases from border patrol officers. This life-changing voyage gave me the strength and determination to always keep moving forward, regardless of the obstacles. My parents are passionate entrepreneurs and my siblings and I all inherited their drive. Moving to Edmonton in an Oldsmobile cutlass supreme in the 90’s, my parents initially started a small Chinese BBQ meat house business. My siblings and I would spend many late nights helping prep the meat and desserts to sell the following morning. Despite their busy schedules, my parents would always find unique ways to spend quality time with us. We put a lot of mileage on our beloved Oldsmobile, taking it on many family trips to the mountains. As a family, we also loved to fish, go apple picking and sightseeing together. I will never take for granted the sacrifices that my parents made for us growing up. For 9 years, my Dad and I were separated from my mom and siblings, to help secure our new life in Canada. This was a very difficult time, but the best decision for our family, for generations to come. When we were finally reunited, it was the best homecoming that you could have ever imagined; having both of my parents and all of my siblings to share my life with again, was simply amazing! Finally settled in Edmonton, I went to NAIT and graduated with a diploma in Telecommunication. I ended up working for Telus in the Great White North, in the small, quaint town of High Level, Alberta. I ended up receiving an education in life along with my work experience. One night, as I was driving on an icy lake in the bleak winter months, I wondered why anyone would choose to live in such isolation, where the only way in and out is by ice road or bush plane. I realized they chose to stay because of the community they shared, and their desire to maintain their heritage. This experience changed me, and when I moved back to Edmonton, I knew I had to stay true to who I was, in all capacities of my life. 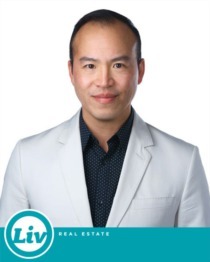 I look forward to making your Real Estate Journey, easy, rewarding and stress-free. I would audition for ‘The Voice’ and hope all the judges turn around in amazement after I sing my version of ‘Try’ by Blue Rodeo that brings the house down. I love food! My wife has to stop me from eating all the food in our house, including the food right off my kid’s plates, even when they are not done yet. If I have to choose, it would be Maki Maki on 81 Ave 101 St; this is the only place I know where I can have pho with sashimi on the side. Invest in companies that are building spaceships for tourism to travel the galaxy. Making a round trip, I will visit the moon first, to see if any cheese is left, and then Mars to play in the sand. I would get in trouble for re-designing the house. I would rearrange furniture out of place and it would drive my Dad crazy because he has certain spots for everything. Drawing on the walls in red crayon was another favourite of mine. Vinh was someone I could instantly trust and that means everything! Vinh listened to all of our wants/ needs and then delivered on these desires. He found us houses in our price range with the amenities that appealed to us. You will not regret going with Vinh Pham! Vinh was fantastic to work with. He always responded to me in a very timely manner. He was very patient in helping me find my perfect first home. I never felt pressured or like he was giving me a biased opinion. He always worked around my schedule and was very accommodating. Vinh went above and beyond in what his job role is. We are now settled in our first home and it is more perfect than I could have imagined. We wouldn't have been here today without his help.